Simon and Henry Daglish work for different media companies, so often end up on opposite sides of the negotiating table, the siblings tell Gideon Spanier. Simon and Henry Daglish are used to the fact that some people don’t know they are related. "He’s got the hair and I haven’t; I’ve got the looks and he hasn’t," Simon chuckles as they explain how colleagues fail to make the connection "all the time". Media is in the blood because their father, Richard Daglish, who died in November last year, was the managing director at More O’Ferrall Adshel, an outdoor poster company that eventually became part of Clear Channel. The half-brothers, who grew up in Ardleigh, Essex, and boarded at The Duke of York’s Royal Military School in Kent, have always worked on opposite sides of the media owner/agency divide. 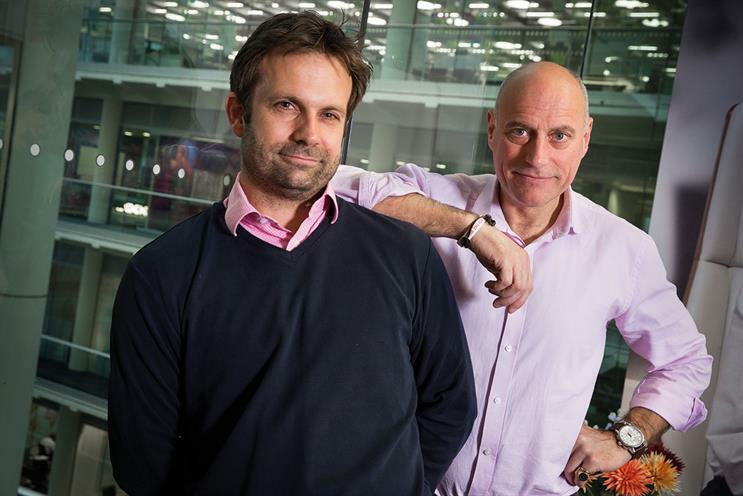 Simon, 50, is the deputy managing director, commercial, at ITV and Henry, 41, is Arena Media’s managing director. Ever since Henry started in advertising, "we very quickly wound up buying and selling to each other". Simon, widely known as Dags, admits it was "odd" at first but it does have its upsides: "There’s an added sense of responsibility. People think if one brother is talking to the other, there’s a bit of skin in the game. And it doesn’t half make Christmas lunch awkward if you screwed it up." Dags, sporting suede loafers with loud orange socks, is the jollier of the pair. Henry, in laced-up leather shoes, is more thoughtful. Both insist they would never allow a fraternal conflict of interest. "The only time" that Henry got a tip-off from his brother was when the sponsorship of the ITV game show Red Or Black? was available. Arena’s client Domino’s Pizza was enthusiastic – which was fortunate because the client stood by them when the show flopped. But some clients expect too much. Henry had to refuse a request from one who wanted him to ask Dags what price a rival was paying for airtime. When Arena was pitching for ITV’s media buying business this year, the brothers maintain they did not discuss it. Dags’ mother left when he was one, so his father was a strong influence. Daglish senior, a bon viveur who enjoyed dining at Mon Plaisir in Covent Garden, went on to meet his second wife, Rebecca, at More O’Ferrall Adshel and they had three children: Henry, Arabella and Olly. "It was a massively social household," Dags recalls. "Usually, there was somebody with a glass of wine by 7pm – there’d be a party." Their father liked having posters around the house, including one in Dags’ bedroom that proclaimed: "Long live the insane art director." ("I’ve always wanted to be an art director but I’m crap at art," Dags notes.) When the family later moved to Cornwall, their home was also a tribute to advertising as old 48-sheet panels were used to construct a pigsty and stables. The Daglishs were a military family, and sending the boys to The Duke of York’s was "cheap". Dags went on to Sandhurst but left after a year, and also had a spell at the chocolate-maker Charbonnel et Walker, where he employed a teenage Henry as a door boy at Christmas. Dags’ father suggested ad sales and introduced him to Express Newspapers and its future boss, Stan Myerson. And so a successful career began that took Dags to the Telegraph, Classic FM, Fox Interactive and ITV. Outdoor is the only medium he hasn’t tried. "With TV, press, magazines, radio – you start off with a relationship with the consumer. A blank poster has no relationship with the consumer," Dags explains. Henry knew by 11 that he wanted to work in advertising. After school (where contemporaries included Steve Parker, now a bigwig at Publicis Media, and Nigel Clarkson, the head of Yahoo UK), he read international business with French at Plymouth. "He studied surfing and cider," Dags – who claims to be "too stupid" for university – jokes. The younger Daglish was ambitious, doing work experience at J Walter Thompson in Paris and won the IPA Graduate of the Year competition. The prize was a placement at Abbott Mead Vickers BBDO, which he turned down – against Dags’ advice. Their father had a friend at Universal McCann, where Henry ended up joining. It turned out to be a job in research but he "didn’t regret it", finding media buying "exciting". He later moved to MPG, then Zenith – including a spell in Australia – and Carat. Dags sought his younger brother’s advice too. When he went for a job at Classic FM, he practised his presentation on Henry. "He has been massively helpful to me," Dags confesses, which catches his sibling off guard. "I’ve never heard that before," Henry exclaims. Having never given a joint interview before, the two aren’t used to talking about each other publicly. A friend says the brothers are "very close", adding: "Both are fixated with running teams and they generate huge loyalty." School instilled their discipline. Dags recalls: "We marched to all our meals; our shoes and clothes were inspected every day." The parents ranged from "lance corporals to generals", which meant "you learn all the skills about relationship-building with people who aren’t like you", Henry adds. Dags’ affection for the school means he has become a governor, sent a son there and persuaded Prince Harry to get involved in fundraising. "Having a great team is the single most important thing," he says of his own career. "I just like people. People are fascinating." So have the brothers considered going into business together? "Daglish & Daglish? It wouldn’t work," Dags says. Henry, though, wouldn’t rule it out. Both are married with two children and live in south London. "The wives are unfortunately as thick as thieves," Henry quips. "If they weren’t, we’d never see each other." Joking apart, the two share a similar view about how advertising has become too worthy. "There are too many people in this industry that treat it as a science," Henry muses. Dags agrees: "Human nature really is erratic, irrational. We could do with a few more Mad Men with mad ideas. That poster in our bedroom, ‘Long live the insane art director’, is what our industry is about." What would their father say? The brothers reply: "He’d say: ‘Let’s go to Mon Plaisir for dinner.’"